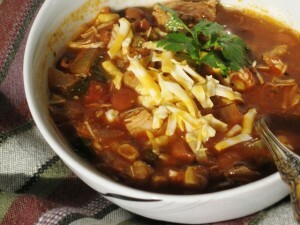 The onset of chilly weather makes us crave comfort foods, so slow cooking chili sounded like the right thing to prepare. The original recipe is by Betty Crocker, but since I customized it a bit, I will post my version for you. Makes 4 quarts of chili. Warm up 2 Tbs. of canola oil in a frying pay, add onions and saute for 1 minute, stirring frequently. Stir in garlic, and saute for a minute longer. Set aside. Plug in a 5 quart slow-cooker, and set it on LOW heat. Add cubed chicken, onion and garlic mixture, and all remaining ingredients expect Cilantro and cheese. Fold gently, to form a well blended mixture. Cover slow-cooker,and let it cook for 8 - 9 hours. Once done, Use a serving spoon to break up the meat to smaller pieces. Serve hot, sprinkled with Mexican cheese. If you prefer, you can use sour cream, instead of cheese.